“Tumbling Tumbleweeds” and “Cool Water” are only a couple of the hundreds of songs created by the Sons of the Pioneers, the most famous singing group in the history of Western music. Charter members Roy Rogers (Len Slye), Bob Nolan, Tim Spencer, and brothers Hugh and Karl Farr (two gifted instrumentalists from Texas) developed a unique style of vocal control and harmony that became the group’s trademark. During the 1930s and 1940s, the prolific Nolan, along with other members of the Pioneers, composed hundreds of songs, primarily for film appearances. Although Roy Rogers left the group for movie stardom, the Pioneers appeared with the “King of the Cowboys” in forty-two films. There were one hundred movies appearances in all, including “Rio Grande” and “The Searchers” with John Wayne. 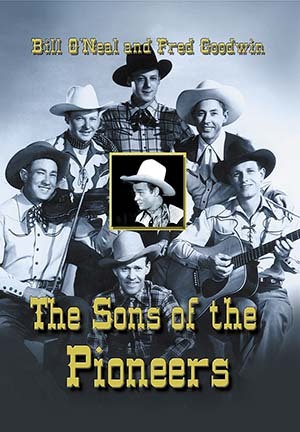 Alumni of the Pioneers include Pat Brady, Lloyd Perryman, and Ken Curtis “Festus of TV’s “Gunsmoke”), and today the Sons of the Pioneers carry on the long tradition of their group in Branson, Missouri.